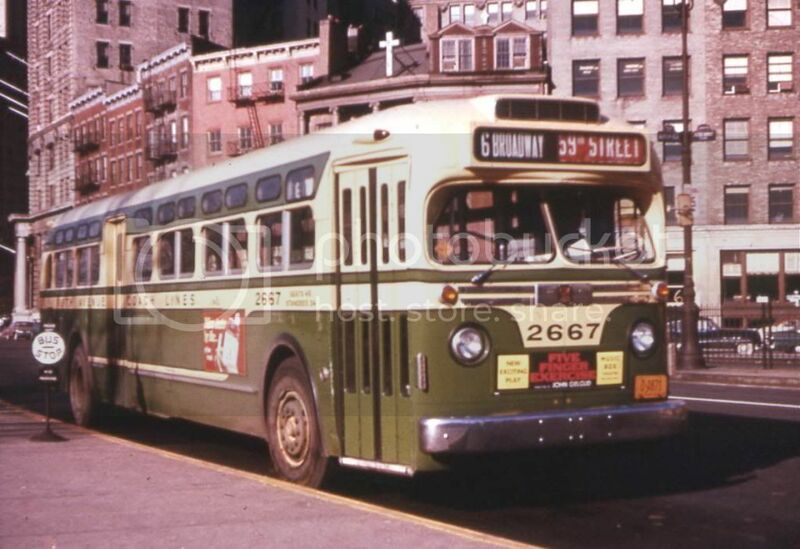 With regard to the photo of the NYCO Model 728 under the (demolition underway) 9th Avenue El, the Route 5 on the roll sign is not today's M5 Fifth/Sixth Aves/Riverside Drive route, which was FACO's old Rte 5. The bus is on NYCO's 5/Sixth Avenue route, which operated between 59th Street and Lower Manhattan on Sixth Ave. and Church Street. MABSTOA inherited this route in 1962, only to end it in 1963 when Broadway and Sixth Avenue below 14th Street were combined into a one-way pair. The Route 6/Broadway took over both directions and the Rte 5 was eliminated. Funny thing is that even though FACO and NYCO were under common ownership their routes used duplicative route numbers, even though parallel routes with the same number were often a block apart - such as the two #5 routes, and the #2 routes on both Fifth and Madison Aves. The advent of MABSTOA and the one way avenue operations put an end to most of that and today there are no duplicative numbers in Manhattan. Also - a point of irony - in 2010 when there were route cuts and combos in Manhattan, the M6 was eliminated completely, and the M5 was extended from Houston Street to South Ferry to cover the southern part of the M6. It is now probably the longest route in Manhattan - from 178th Street to South Ferry. The M101 was the longest when it ran to City Hall, but its south terminal is now 6th Street. At what point did the ex-FACCO #5 have its northbound route shifted to Sixth Avenue between Houston Street and 57th Street - I presume it was the point Fifth Avenue became one way southbound on Jan. 14, 1966? There was another irony to the 2010 route overhauls. Since '66 the M1 had been largely ex-NYCO, with the southbound route of Fifth Avenue between 135th and 40th Streets being practically the only vestige of FACCO's #1. But after 2010, the M1 was rerouted to Madison Avenue north of 25th Street - and all the way down Fifth Avenue up to 8th Street. That is where you see the southbound route more in line with FACCO's old #1. Here's then New York City Mayor Edward I. Koch (in shirtsleeves) in a shot dated May 16th. 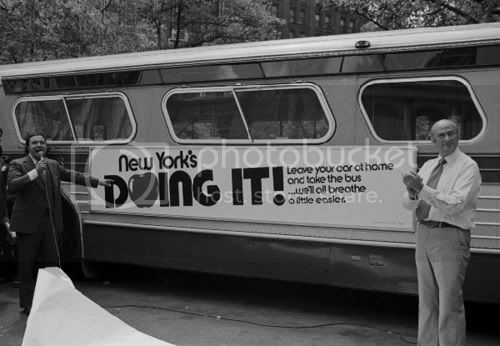 1979 launching his "New York's Doing It' campaign to encourage New Yorker's to use public transportation. If you've assumed that the posed bus (operating for the Manhattan and Bronx Surface Transit Operating Authority - MaBSTOA) is a GM New Look look again because it's a Flxible and probably a Model 53102 very recently delivered in view of its pristine condition. BTW; how do I know it's a Flxible - what's the giveaway? It's amazing that they were already thinking 'green' in those days. Photo courtesy on the New York City Archive. I could swear the guy on the right was the late Queens Borough President Donald Manes . . . besides, the small window gives this away as from the 1977 orders. By the '80's, and up to the point of his death, Manes' haircut was indeed conventional. Great find Mr. L! I always love riding these buses on the B-60 route when I was growing up. When seated at the rear, those long rear overhangs made a wonderful amusement ride along those bumpy Brooklyn streets. 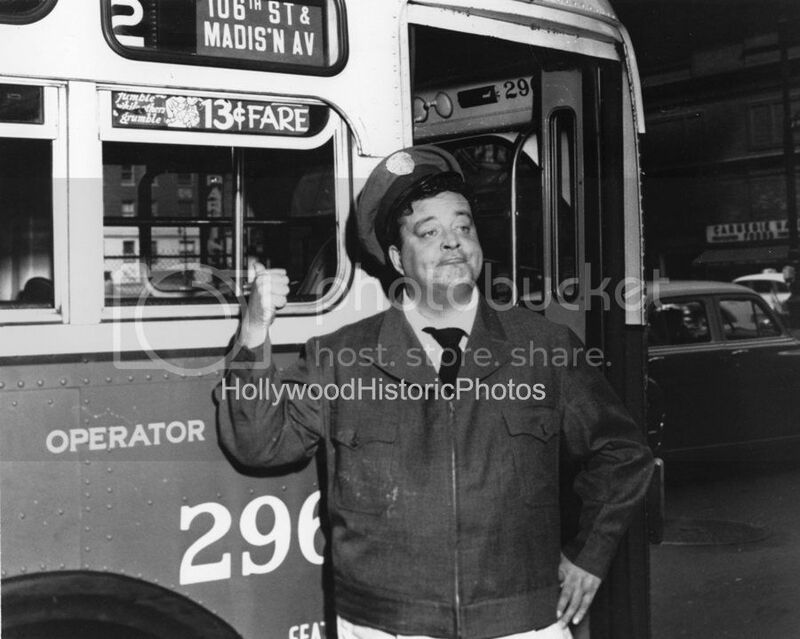 And speaking of Ralph Kramden, we're all familiar with the famous photos of him behind the wheel of 2969 - once shot with Alice, Trixie and Ed peering out the windows behind Ralph and the other of Alice about ready to hand Ralph his lunchbox. The question is, does anyone know what route Ralph's 2969 was signed for? Well here's the answer along with another Ralph pose in a lesser known and rarely seen publicity photo. His two other famous photos never show the destination. Personal head scratcher! How is it that those destination sign makers couldn't fit an "O" in Madison? Top photo courtesy of unknown source from Facebook; Bottom photo courtesy of Hollywood Historic Photos for educational purposes only. It was NYCO's route 2 - which, along with NYCO #1, was assigned back then out of 100th Street depot, as was NYCO #18 (later designated M18, now M86 Select Bus Service) on which 2969 ran for much of its active life (well into MABSTOA days). Wonder if the '2A' designation was for FACCO's route to distinguish from NYCO's, or the other way around? # 7141's paint scheme is very much the same as the last 90 GM TDH 5106's purchased by Fifth Avenue Coach Lines in 1959 with 40 of those going to affiliate Surface Transit (see Fifth Avenue # 2667 below). This 5 was NYCO's Sixth Avenue route, wholly unrelated to FACCo's Route 5 - Fifth Avenue/Riverside Drive. NYCO 5 lasted all the way till Nov. 10, 1963 after which it was discontinued and absorbed into the heretofore Broadway/7th Avenue NYCO 6 - whose northbound route thereafter (until its own 2010 demise) ran through Trinity Place, Church Street and Sixth Avenue (whose entire route south of Herald Square completed its conversion to one-way northbound at that point). If the Mack's up Third Avenue, then it would've been ex-Surface. 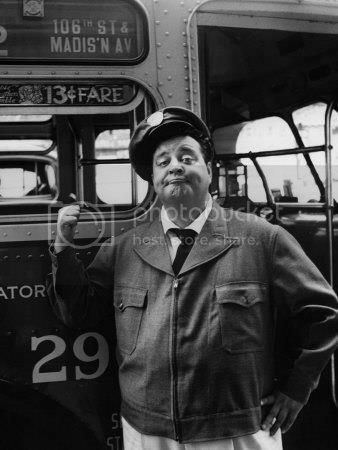 How many of the 1963 order (3301-3555) did Manhattan depots and bus routes run by MaBSTOA get initially? I know a lot of that first order for MaBSTOA went to the Bronx to replace the most dilapidated of the ex-Surface Macks and GM Old Looks. When did FACC and/or its affiliated companies get routes on 6th Avenue? I am looking at a repo of booklet entitled " Fifth Avenue Coach Routes and Vistior's Guide" reprinted in 2005 to commerorate the 100 anniversary. It shows the routes of FACC in 1939-1940 with the extension of the #15 to the World's Fair. There is no route shown operating on "Sixth Avenue". 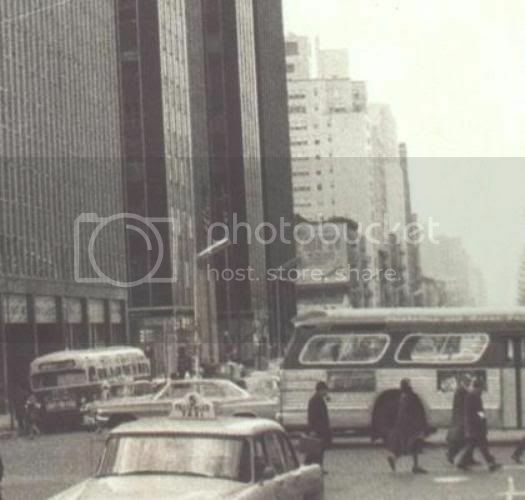 b) On Jan. 14, 1966, when Fifth and Madison Avenues were converted to one-way traffic, the 5's northbound route was shifted to the rest of Sixth below 57th Street. It was thus the only Fifth Avenue route of the ex-FACCo network not to be moved northbound to Madison. I was thinking about checking to see whether any of those stores still exist - the old phone books would be a great idea too. 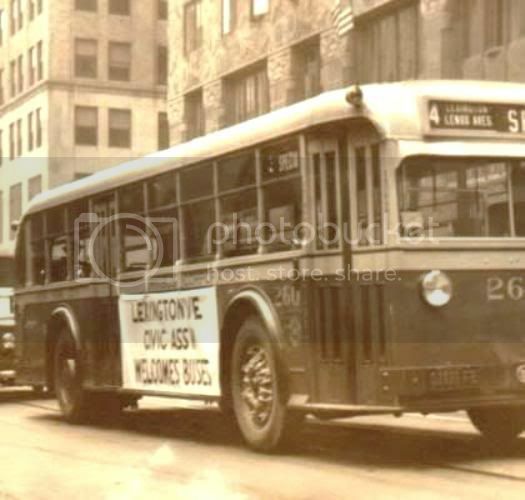 Buses that are usually involved in campaigns of any sought have some kind of banners especially under the window belt as pictured below on NYCO # 260 (location unknown - but might be on Lexington Avenue). Thanks for the update and the great map. 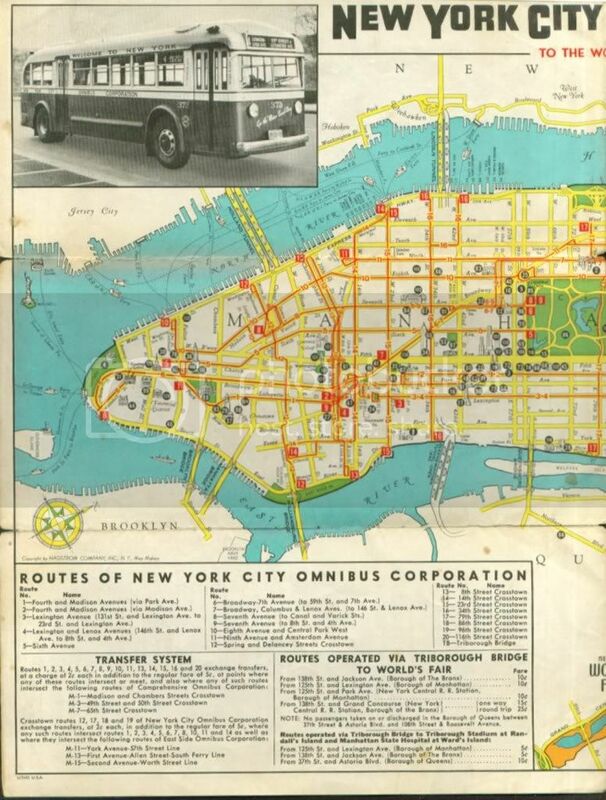 Here's a couple of NYCO maps that might interest you. You might notice that most photos of vintage Fifth Avenue Coaches are taken in and around Washington Square Park which was the fashionable thoroughfare's southern most terminus and the end or the beginning (depending on which way you look at it) of no less than five of the company's very prestigious routes including the 1, 2, 3, 5, and 19 with northern terminations at various points in both upper Manhattan and Harlem. So, it's of no surprise to once again see the Square as the colorful backdrop for fleet number 2414 - a 1950 GM Model TDH 4509 and one of 74 (2363 to 2437) purchased by the company in June of that year. Number 2414, signed for route #2, is very new in this image and still sports its original and trademark Omnibus two-tone green and cream livery which would eventually change to a very plain green and cream wrapper. The arch in the background, which dates to 1889, was originally constructed of wood in celebration of the centennial of George Washington's inauguration as president and was so well received that it was rebuilt in granite as a permanent monument in 1889. 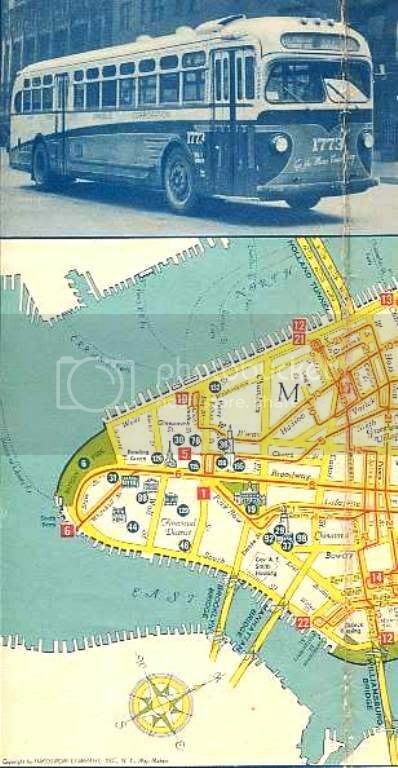 After the 1962 strike against Fifth Avenue Coach Lines and Surface Transit, and the takeover of all their routes by MaBSTOA, Routes 1 and 19 disappeared from the itinerary, thus leaving only 2, 3 and 5 to terminate there. By mid-1963 a few of the newly-ordered MaBSTOA TDH-5303's numbered within the 3301-3555 range would stop along that loop. Those would be among the last buses to travel through the park, as effective Sept. 2, 1963 Washington Square was officially closed to all bus traffic, leading to massive reroutings and shiftings of the southern termini. 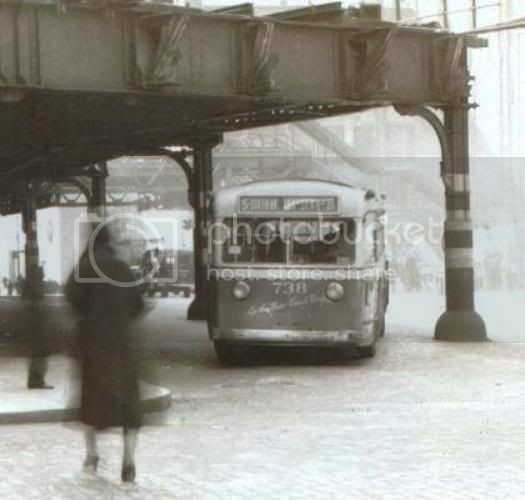 The color photo below has a dual value in not only espying a bit more of the history of New York surface transportation but as an important piece of Manhattan's own past. 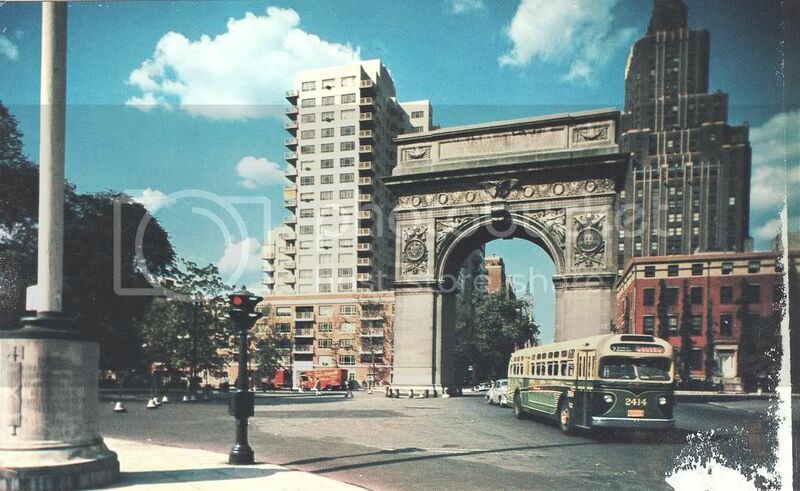 The intersection is that of Washington Square North and Fifth Avenue just across from the entrance to Washington Square Park in a snapshot taken sometime not long after Fifth Avenue Coach was absorbed into the newly formed Manhattan and Bronx Surface Transit Operating Authority (MABSTOA) in 1962. Two generations of GM Coaches are seen heading south on Fifth toward the park and both flagged for MABSTOA with the first presumed to be either an ex Transit Authority or Fifth Avenue 5100 Model followed by a newly purchased 5300 series. Before the mid nineteenth century, Washington Square North was considered to be 'uptown' Manhattan with little more than grasslands, meadows and an occasional farm house beyond and the fashionable upper Fifth Avenue with its marble mansions and exquisite shops then being only a drawing board concept for the future. It was in this era that the captains of industry of the borough built themselves the elegant townhouses that can still be seen as landmarks dotting the perimeter of the park with one of which taking center stage in our image. 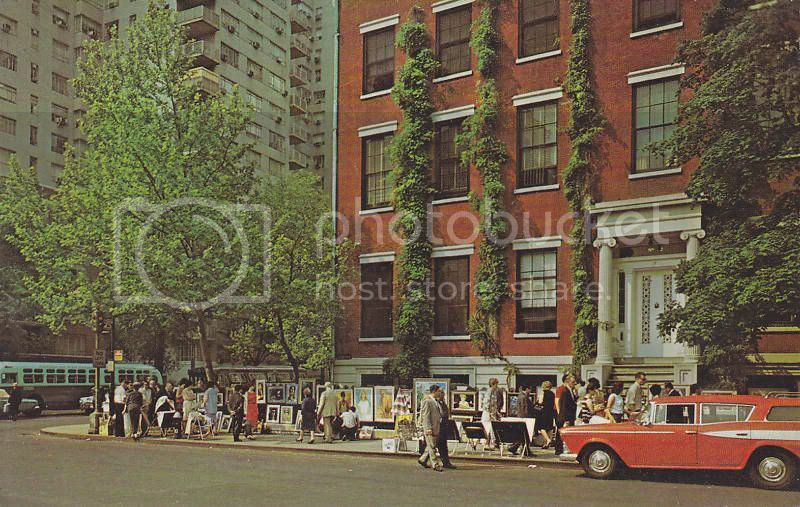 Notice that the Greenwich Village artist colony shows its wares along the historic strip on a sunny weekend afternoon. That 5300 series 'fishbowl' - anyone sure that ain't one of the 5303's that were the first ordered specifically for MaBSTOA and delivered in mid-1963? It was in that year, after all, that all 'old looks' were painted in the two-tone green already in place on TA rolling stock, and the 120 'Fishbowls' ordered by Fifth Avenue Coach Lines in 1960 for both it and Surface Transit painted in the same scheme as the TA's 'New Looks'. And those colors are in evidence here. The historical significance is even more so, as Washington Square was closed to all bus traffic effective Sept. 2, 1963, hence these were among the last to pass through there.